Cook the spaghetti according to the package directions in boiling water seasoned with 2 tablespoons of kosher salt. Drain, rinse and cool. 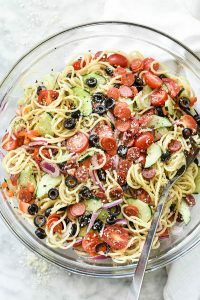 Add the spaghetti to a large bowl with the cucumbers, red bell pepper, red onion, cherry tomatoes, black olives and parmesan cheese. In a pint jar with a lid, add the olive oil, red wine vinegar, Italian seasoning, sugar, garlic clove, kosher salt and freshly ground black pepper. Shake well and pour over the spaghetti mixture and toss to coat. 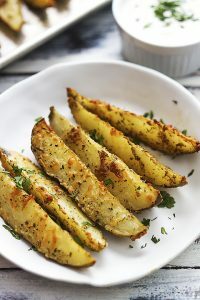 Add more parmesan cheese and salt and pepper to taste. Chill for 30 minutes up to overnight.